Being the second largest state, Texas has a huge population which requires an effective healthcare system. In order to ensure that healthcare services are properly delivered, the number of schools and colleges offering programs in nursing, pharmacy and physical therapy are increasing. Among some of the most popular undergraduate programs being offered in the field is the BSN program, which provides a platform for both, those aspiring to become nurses and those looking to advance their nursing careers. BSN programs in Texas are offered both on-campus and online by most of the educational institutes. Practicing RNs can have the opportunity to enroll in an accelerated BSN program depending upon their educational background. Typically BSN programs are a combination of classroom learning and hands-on experience, taking about four years to complete on average. However, RN to BSN programs may be completed in one to two years. Interpersonal skills to ensure proper communication with colleagues and patients. No history of criminal behavior and drug use. 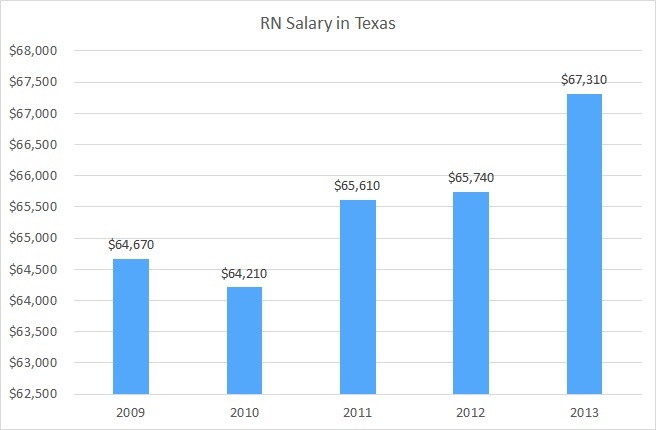 According to the Bureau of Labor Statistics, in 2012 the median pay for RNs in Texas was $67,860 per year with an average of $32.62 per hour. Registered nurses (RNs), on the whole, have consistently earned more, each year, in Texas. In 2013, RNs earned a median annual salary of $67,310.